ZTE Grand X, Dual Core Android Phone. Smartphone ZTE Grand X officially rolled in Indonesia in December 2012 and is slightly different from previous versions of ZTE Grand X the global version. 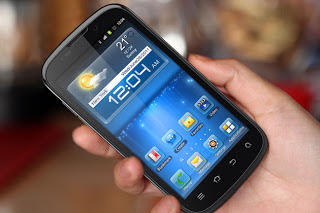 If the global version of the ZTE Grand X operating system based on Android Ice Cream Sandwich, now Grand X ZTE has officially rolled in Indonesia using the http://littlebitjohnny.blogspot.com /2012/12/sony-xperia-e-hp-android-jelly-bean.html">Android operating system version Jelly Bean. Performance of Mobile Android ZTE Grand X is quite hefty as it is equipped with a dual-core ARM Cortex A9 1GHz speed combined with a PowerVR SGX 531 GPU and 512 MB RAM. Moreover, ZTE Grand X has supported the use of two SIM cards or dual as well as access to canals 3G/HSDPA and Wi-Fi alternatives. For more details see http://littlebitjohnny.blogspot.com /2013/01/specifications-zte-grand-x.html">Specifications ZTE Grand X. You have finished reading ZTE Grand X Android Phones and many articles about Tech Gallery in our blog this, please read it. and url link of this article is https://littlebitjohnny.blogspot.com/2013/01/zte-grand-x-android-phones.html Hopefully discussion articles on provide more knowledge about the world of new tech gadgets.